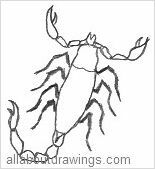 I began creating some drawings of scorpions even though I have the perception that it is a difficult topic due to their unusual size and shape. 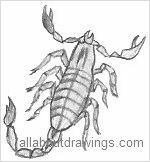 If we are asked to draw a scorpion from memory, it appears in our minds as an almost impossible task because we all know a scorpion is a tiny being with lots of joints and points. I'm on a mission teaching myself to draw so I have to push past any fear that I may feel and just get into it. If you feel the same as me, simply start off by breaking the process down into achievable steps. First, you need to have a good, clear reference picture. Next, create an outline indicating only the main lines that you see. It can also be of benefit if you pencil around the boundary of the scorpion on your reference picture, just to get the feel of its shape and construction. In my outline (pictured), I purposely left the legs in single line form to illustrate their direction and placement of joints. This really helps to simplify the animal which is essential for us beginner hobby artists. Once we achieve a reasonable outline, suddenly the whole illustration becomes a possibility. I think the hardest part of learning to draw is finding a method to successfully get images onto paper. I haven't finished exploring all avenues yet, so for now I concentrate on building good outlines, the rest is easy after that's done. I also think if you are determined enough to learn about art, then you will most certainly succeed. The mind plays a huge part in every aspect of our lives. If we learn to draw simplistically, we teach ourselves how to see things in a way that we can put them onto paper effortlessly. Go ahead and try copying the template of this intricate little creature and you will realize you are a very capable artist. On the other hand, if you don't try, you will never find out about any of your capabilities. A scorpion is an animal and not an insect like many people believe. It belongs to the arachnid group of animals along with spiders, mites and ticks. Scorpions are known to be black or a yellowish color and are found in warm countries in most parts of the world. They have four pairs of legs, a pair of large claws and a pair of tiny pincers. The large claws are used to catch and crush their prey. The scorpion has a poisonous sting on the end of it's tail which is used to stun or kill their prey. The poison in the sting can make people sick but it seldom kills them. Scorpions are more active at night with insects and spiders being their prey. I was interested to learn that scorpions can be found at night by using an ultraviolet light. I haven't done the experiment myself but apparently scorpions are fluorescent. Most of those traits sound very much like belonging to a scorpion so it is a logical choice. When you try to draw a scorpion, all of those joints and things are bound to keep you out of mischief for a little while! I did this scorpion drawing as an experiment to see if it would be a useful scorpion outline but I soon realized it could be further simplified with single lines to represent the legs. If you have the desire and dedication to learn drawing, then that great attitude will most certainly help you succeed. 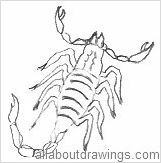 All of these drawings of scorpions are very basic and are great to use in any future projects you might have. Enjoy!